If Laurel and Hardy were grown men who acted like children, Harry Langdon, the most helpless, immature, sexless, timid and downright stupid of all the silent clowns, regressed even further, becoming, in effect, a middle-aged baby, seemingly retaining, by some dogged self-abstraction, the obliviousness and immunity of an embryo to the outside world. His most characteristic gestures and roles, among them the main characters of Frank Capra’s Tramp, Tramp, Tramp and The Strong Man, both released in 1926, combined the masculine and the feminine, the adult and the child. Langdon’s innocence and pathos infuse every frame of film, heightened by complete intellectual blankness to most of what surrounds him. A master of the slow burn, every action and reaction he ever emitted on screen betrays a truly infantile perplexity. Even his makeup created a strange mixture of discordant opposites—the white powder and dark, heavily outlined eyes—that turned him into a combination of clown, infant, and hermaphrodite. 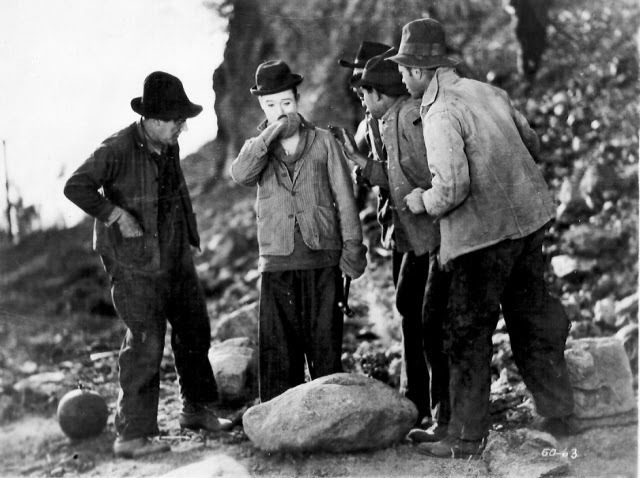 Layered over an obviously adult face, the childlike getup resulted in what James Agee called the look of “an elderly baby” or “a baby dope fiend.” His outfit, made up of round, battered soft hat turned up at the brim, tight jacket with the top button fastened, the others unbuttoned, spreading open ridiculously at the hips, baggy trousers and awkward, oversized shoes, only heightenaed the childish absurdity and inadequacy of his characters, who were completely unfit for the world of men—and especially of women—and incompetent at adult social behavior. Although in both of Capra’s films Langdon gets the girl and emerges victorious from whatever pursuits he undertakes, his success is not in the least due to any conscious effort or action. Winning Joan Crawford’s character, as well as the race, and saving his father’s business in Tramp, Tramp, Tramp or resisting the evil city moll, wedding the blind girl from rural Cloverdale, or ridding the town of its criminals, debauchers and bootleggers in The StrongMan are all a matter of sheer, dumb luck. The essential Langdon situation, which pits a little, unprepared man against a huge and impossible opponent, is no better presented than in Tramp, Tramp, Tramp, when Harry stands up to the cyclone ripping through a defenseless small town. The only response the character is capable of—hurling a handful of stones at the tornado—is feeble, childish, and undeniably stupid, a senseless action against an unconquerable foe. Unexpectedly and unexplainably, the foe collapses. The cyclone, in this case, simply turns around and goes off, “chased” by a barrage of pellets. Of course the outcome has nothing to do with Langdon’s actions; the foe was about to collapse anyway. The gag that follows this sequence, however, is just as significant: in a moment of false masculine pride, Harry spits defiantly at the retreating tornado, only to have the wind blow the spit back onto his own jacket. This boomerang action is essential to Langdon’s screen persona: a ball, once thrown, will invariably bounce back and hit him in the head—as it does in the last scene of the film, featuring the character’s infant child, played, of course, by Langdon himself in an oversized crib. The boomeranging underscores the clown’s helplessness, the ineffectiveness of his actions, and the ease with which trouble finds him, with no encouragement on his part. When real trouble finds Langdon, be it a cyclone, an enemy soldier, a prison sentence or just a bad cold, his reaction is always utterly childish. As the only soldier who doesn’t know WWI ended a week ago, Langdon’s character in The Strong Man is the epitome of childish obliviousness. Alone on a battlefield, the character tries shooting an empty bottle for target practice. Of course he shoots holes in everything but the bottle. The concept of a gun is foreign to him, dangerous and grownup. With a slingshot, he is a master marksman. As an enemy soldier approaches, Langdon is lost in thought, reading a love letter from overseas. The gag is, of course, repeated, made that much funnier for the reaction of the encroaching soldier when he is met with slingshot fire. One of The Strong Man’s funniest and lengthiest gag sequences, carefully constructed and brilliantly executed, is based on nothing more than the simple impasse of having to take cold medicine while traveling by bus. The exquisite pacing, Langdon’s slow, dazed eyes, the quick eyebrow twitches of disbelief, his apple cheeks and the crooked dawn of a smile or pensive furrow of the brow turn the scene into a masterwork of physical comedy—and Langdon was always a comic of the face, not the body. The sequence begins with a situation familiar to anyone who has ever seen a child’s response to medicine. Having to take his cough syrup—and having already laboriously poured it into a spoon—Langdon grimaces in anticipation of the medicine’s bitterness, holds his nose to avoid the smell, and pulls his head back as if to escape the inevitable. What is truly inevitable is the fact that he will sneeze into the spoon, spraying syrup all over himself and the nearby passengers, one of which shoves him in return. Sluggishly, as if in slow motion, Langdon reacts to the abuse, one of the few instances in which he actually takes action: his pudgy hand closes into a little fist and, glaring at his opponent, he prepares to take a tiny jab at the man’s chin, only to be forcefully prevented by the intended victim. When Langdon gets the camphor mixed up with Limburger cheese, the man sitting next to him decides he’s had enough, throwing Langdon out of the moving bus. The character rolls down a hill only to land through the roof of the bus in the exact same seat. On arrival, he is as surprised as his fellow passengers. His reaction exemplifies the famous Langdon take: seemingly in slow motion, he looks around and stops dead. Anxiously—or joyously alike—he emits a frozen stare of disbelief for five seconds. He blinks for three seconds, pressing his lids together forcefully to make sure he is indeed awake and his eyes are functioning properly. He stares for five seconds. He blinks. He stares again. Repeat. For the quintessential Langdon character innocence and naiveté applies to all situations. 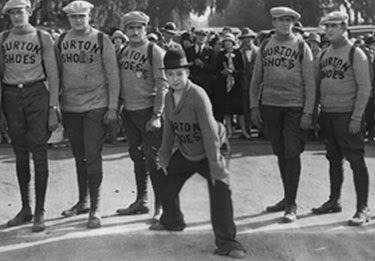 In Tramp, Tramp, Tramp, tired and hungry from walking in a cross-country race—the fundamental Keaton plot without the dashing heroics and far-fetched strategies of a Keaton character—Harry steals some food. The theft is rather easy to discover—his mouth is stained with berry juice, a bulging chicken sticks its head out of the character’s ragged sweatshirt, a watermelon falls out of his pants, dragging them down with it. Like a child caught with his hand in the cookie jar feigning guiltlessness, not all the innocent looks in the world could erase the chocolate-chip stains, so Harry is sent to prison, where he joins a work gang. Of course, he will do the kind of work that best suits him. Finding a tiny toy-sized hammer, Harry chips away at little rocks, until a guard directs him to choose a more appropriate instrument for toil. Noticing his incapability of picking up a man-sized hammer—he either drops it or the head falls off—an exasperated guard tries to help in finding a more suitable tool. Only after digging through the pile of assorted instruments does the guard realize he has given Harry his rifle, which he is now pointing at the man oblivious of its power. Confused and assaulted by the frantic activity his position sets in motion, Harry drops his prisoner’s ball on the guard’s foot, who hops away in pain as the convict daintily toddles back to his work as if nothing had happened. When given a gun to use in the upcoming escape attempt, he is so unaware of what’s going on he thanks the prisoner who has given it to him and proceeds to chip away at his tiny toy rock with the grip. Langdon shows the same denseness and incomprehension in his relation to women. In Tramp, Tramp, Tramp, he responds more successfully to the billboard picture than to the actual woman, and in The Strong Man he can only connect with Mary Brown because, like him, she is physically impaired and spiritually pure. A newcomer to the city in The Strong Man, the character is desperately searching for Mary, his wartime sweetheart. A gangster’s girlfriend, needing to dispose of some cash before a police search drops the bills in Langdon’s pocket, which, of course, has a hole in it, allowing the money to fall into his coat lining. In order to retrieve it, the moll pretends to be Mary. In the cab ride back to her apartment, the woman tries to get the money back, and Langdon thinks she is trying to seduce him. He becomes the quintessential ingénue of melodrama, scared to be raped by the city slicker—or slickeress—and no virgin—Griffith or otherwise—has ever protected her purity more fiercely. Under the impression “Mary” is trying to feel him up in the car, Langdon’s character slinks away to the farthermost spot on the seat, backed to the wall, stupidly holding on to his hat for protection. His eyes, open wildly, betray a complete incomprehension of any possible reason for such puzzling behavior on her part and a paralyzing fear of this unknown. Once in the girl’s apartment—after a journey that involves feigned fainting spells, stairs, buckets, ladders, railings, and a lot of falling down—Langdon wrestles with her on the bed, only with a knife to his throat indulging her with a kiss—if she wants it that bad. The kiss, however, is not the sexual prologue, but, in his mind, the only possible finale. Escaping the clutches of this seductress, Langdon notices a sign for Mary Browne’s Art Studio, and goes in. A naked woman stands before him posing for a sculpture, but it takes him almost a full minute to come to this realization, after which he runs away in a burst of frantic activity and falls down the entire flight of stairs he had just climbed, his sexual innocence once again assaulted. Placing Langdon’s supreme inexperience and mildness in thematic opposition to cunning and cruelty presents no particular moral or social point of view—except perhaps that nice people are nicer than not nice ones, and deserve to win in the end—but it creates characters that are memorable to say the least. The passivity and sweetness of the Langdon character is unparalleled in silent film, not even by the virginal Lillian Gish. 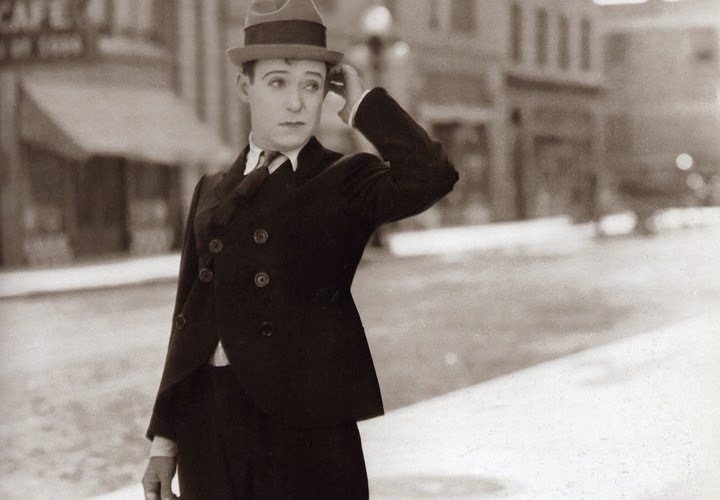 His determined pace reminded us that speed and slapstick were not synonymous, and the absolute ignorance and infantilism that surrounded him like a protective sheath, ensuring his happy ending, assured us that the meek do indeed inherit the earth, at least in Capra’s world. Bursting out of his suit like an overgrown baby, incapable of sensible adult thought or action, Langdon succeeds at all his endeavors, and perhaps at winning our hearts specifically because, and not in spite, of his innocence and incompetence. Coming out of nowhere to rise to stardom and then disappearing just as quickly, Langdon might not have had the depth of feeling and complexity or the breadth and range of his comedic contemporaries, but the films he made with Capra, perhaps more impressive in their parts than in their wholes, never fail, almost nine decades after they were made, to make us laugh.